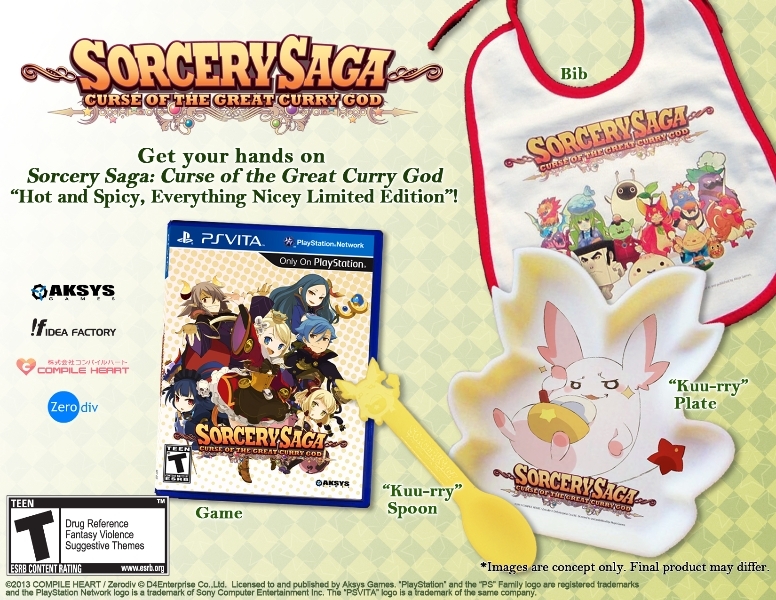 Aksys Games have tagged Sorcery Sage: Curse of the Great Curry God as “An Absolutely Scrumptious Dungeon Crawler RPG” which seems very fitting considering their new Limited Edition which includes a plate and a spoon. Yeah, you read that right! A cute “Kuu-rry” plate and “Kuu-rry” spoon will be included with the other perks of this LE. Did I mention you get a bib as well? If I could pick a theme for the day it would be “silly and fun”. To keep with that theme I give you the details on the “Hot and Spicy, Everything Nicey Limited Edition” set. I think I fell in love with this LE and I would love to hear how you feel about it in the comments below.